I’ve been a yoga fan for a long time now, but there was once an unhappy, blurry Time Before Yoga when I didn’t know what it was and wasn’t interested. That was when I had a stressful job, an unhealthy social life, was exhausted, and didn’t even know what bad shape I was in. My friend, who hated her job in Hong Kong and spent all her free time getting as far away from it as possible, planned a trip to India that included a stop in Rishikesh, and that’s how I first learned yoga at a Maharajah’s palace on a hilltop in the Indian Himalayas. To those who haven’t heard of Rishikesh, it’s located on the Indian-Nepali border in the beautiful mountain state of Uttrakhand. Straddling both banks of the Ganges River, Rishikesh is famed as the birthplace of yoga. And I arrived at the Yoga Capital of the World not knowing anything about it. How to do it? Why do it? So what? It didn’t matter. If you’re going to learn the secrets of this ancient discipline, what better place to start than its Indian birthplace? Decades before I’d ever heard of Rishikesh, this riverside town nestled in the Himalayan foothills north of Delhi had gained instant world fame in 1968 when the Beatles came to learn Transcendental Meditation from their guru, the Maharishi Mahesh Yogi. Iconic photos of the hirsute rock stars with their even shaggier guru could be seen in shops around town, to remind a younger generation of pilgrims that “The Fab Four were here” way, waaaay long before One Direction was born. (The Beatles were the One Direction of their time. And also the Take That and Duran Duran of their time, if we’re counting backwards from One Direction. The Beatles were the original British Boy Band of all time!). The ashram where the Beatles stayed had been an abandoned shell for over three decades. It lay crumbling and forlorn, visited as a Beatles shrine by wandering western tourists (I’ve heard that if you ask an Indian person who the Beatles were and they have no idea. They have their own Bollywood stars to admire). In December 2015, the government re-opened the ashram to tourists and Beatles pilgrims who can come to see Beatles graffiti on its walls. Their time at the ashram was creative and productive. It’s known that Beatles wrote 40 songs during their stay here. Though Rishikesh may have a hallowed reputation, don’t expect to see rainbows and golden halos beaming out from this town. It’s a modest Indian country town, crowded with new and seemingly mass produced temples and ashrams, around which the local vendors conduct a bustling trade in religious trinkets like rudraksh mala strings of offering beads, scriptural booklets, piles of screeching red bindi powder, Ayurvedic medicines, and more. There are also the more tourist-oriented souvenirs like wooden foot massagers, peacock feather fans, shoulder bags, and polyester blend shawls masquerading as cashmeres and pashminas. “Madam, many many shops here, but do not buy,” advised our self-appointed tour guide, a sprightly man who had pounced on us the minute we’d emerged from our jeep. “Everything comes from Delhi and Bombay,” he warned, in lilting tones, waving his hand emphatically at the piles of polyester pashminas. There was a relaxed ambience about the town, aided by the peaceful setting among the hills. Here, not far from where the Ganges emerges from its sacred source in the Himalayas, the water is a beautiful, clean, strangely luminous green, with a glacial chill that is refreshing to the holy devotees that bathe in it from the many ghats (bathing steps). Rishikesh spreads across both sides of the Ganges, spanned by the Lakshman Jhula suspension bridge built in 1929. The town was bustling with visitors and Hindu pilgrims, ranging from orange clad sadhus (holy men), Indian families on holiday, and a few too many western backpackers who had adopted the neo-hippie look of cotton khurtas (local pyjamas) and leather chappals (Indian sandals), which didn’t seem to include soap or shampoo. Some arrive here as part of the four-stop Himalayan Ganges holy pilgrimage route, while others come to study yoga and meditation in the numerous ashrams radiating from the town along the river. The ashrams offer courses and accommodation in varying degrees of ascetism, so there seems to be a choice of ashram to suit the needs of all types of students. The International Yoga Festival is held here annually every February, when yoga and meditation masters converge from all over India to teach and students from around the world come to learn. Since Rishikesh is a holy pilgrimage town, it is strictly vegetarian and alcohol is prohibited as well. According to the principles of yoga, one must live a life that is pure in body as well as mind, unpolluted with meat or impure substances. It’s therefore ironic that some of the backpacker hippies that trawl through town come here ostensibly to study yoga but spend half their days in a narcotic stupor. “They are coming to learn holy things, but mostly they are all day smoking. Even the women.” said our guide, shaking his head in disapproval as as a dread-locked blond hippie drifted past in swathed in robes, beads, and a cloud of dust. It’s not all hippies… Sometimes future kings come visiting. Even Prince Charles and Duchess Camilla get into the vibe in Rishikesh. The royal couple are delighted to accept a plant from Guru-ji. What sort of plant do you suppose it could be?…. 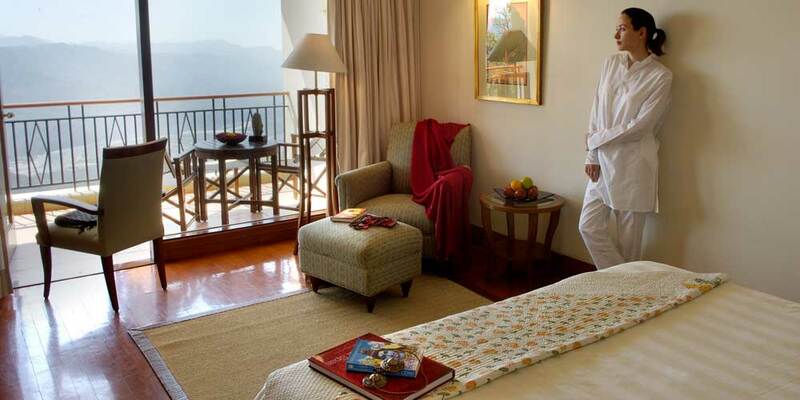 Ascetic wannabes may study at Rishikesh’s numerous ashrams, but my destination was the Ananda in the Himalayas, India’s first luxury spa resort, located at the palace of the Maharajah of Tehri Garhwal perched high on a hilltop above Rishikesh. Forty-five minutes’ drive up the hill yet a world away from the bustling riverside town below, the resort is India’s first luxury destination spa. Located in the palace grounds of the Maharajah of Tehri Garhwal , it sprawls across 100 acres of mountain top, offering a bird’s eye panorama of the surrounding hills, the Ganges, and the town of Rishikesh spreading in the valley below. I love this beautiful map of Ananda in the Himalayas. The Maharajah’s palace in on the right, yoga pavailion in the middle, and amphitheater, guest hotel, dining room, swimming pool, and spa on the left-side ridge overlooking the Ganges valley below. I could see the yellow palace perched high above as we wound our way uphill towards it. I was all agog as we drove up the hill and into the palace driveway and was ready to jump out and admire the glory within I love old palaces and historic buildings. But … wait a minute … it seemed that we had driven past the palace and were heading down a narrow side road towards the back of the property, with the palace entry receding behind us. Huh? “What! Where are we going?! Aren’t we staying in the palace?”, I asked the driver. “Oh no Madame! Maharajah is living in palace. Guests are sleeping in the backside. Hotel is here, Madame,” he said, as we drove up to a modern, nondescript rectangle perched on a ridge behind the palace. “All new”. he added proudly. Oh. I felt deflated. Oh, look who came to visit! Prince Charles and Duchess Camilla arrive at the palace. Of course. Where else would they be. There was no reason to be disappointed though. The rooms were modern, luxurious, had big views, and even the bathrooms had huge picture windows overlooking the valley spreading below. This was the view from both the bedroom and the bathroom. And, if you really must, you do have the option to stay in the palace in the Viceregal Suite which includes living and dining rooms, a spacious bedroom with a period four-poster bed, and a price to match all these lovely trappings. Ananda in the Himalayas is a destination spa offering wellness treatments based on the ancient sciences of yoga, Ayurveda and meditation. Translated from Sanskrit, “Ananda” means “health and contentment” and the spa focuses on holistic well-being. In addition to the menu of massages and body wraps that are to be expected at any spa, the Ananda offers a regimen to teach guests how to nourish the soul from within. There’s an Ayurvedic doctor on call to diagnose your body type and prescribe a course of treatment and diet based on 2,000-year-old practices using herbs and oils. After my consultation with the Ayurvedic doctor, I was prescribed some relaxing Ayurvedic oil massages. Daily yoga and meditation classes were taught in the open air marble pavilion on the crest of a hill in the palace gardens, or in the amphitheater. On rainy days, the classes were taught in the palace ballroom, where our chorus of “Om’s” reverberated in the darkened hall where the British Viceroy once entertained, while curious monkeys peered in from the trees outside. I only saw the monkeys from a distance, which is where I like them to stay. Sometimes they can be not so cute and much more scary close up. While walking back from the ballroom yoga class one day, we ran into a distraught, very freaked out Canadian lady who panted shakily that she’d just been attacked by a bunch of monkey thugs who had mugged her in the garden path. She was all terrified and very shaken up, so we took her to lunch with us, eventually ended up visiting her at her house in New Delhi and remain friends with her to this day (She still talks about those monkeys too). Every evening, a hollow bamboo delivered to my room contained a scrolled schedule of the next day’s choice of daily changing activities, which included hiking in the hills, nature walks, a palace tour, cooking class, squash, billiards, aerobic classes, white water rafting, and visits to nearby ashrams. I opted to enjoy the novelty of swimming in a pool 3,000 feet above sea level while waiters served lunch on a tray. Not that I am like a spoilt poodle who sits on a silk cushion, but we’d already done some hill hiking in the neighbouring district of Almorah, which felt like I was having a heart attack and was going to die on the spot. What the hell was wrong with me? The other hikers looked at me curiously as if I was some kind of freak. “What’s wrong with you,” asked my friend, puzzled. “you look like you’re going to die.” ( I was doubled over and gasping for breath. That’s when I realized how out of shape I must have been). A gentle pranayama breathing class in the pavilion was what I needed. It’s not hard to relax when you’re in a palatial garden surrounded by 100 acres of virgin forest, breathing in floral-scented pure mountain air. “Being There” is easy. Staying there is what you learn to do in your mind, once you’ve completed the pranayama breathing class and gone back home. Have you been to Rishikesh or Ananda in the Himalayas? What was your experience like? You really captured Rishikesh, Chami! Haha Thank you Jane! Did you go there during your Indian travels?